Home > Paper Money, Checks, Annual Reports, Postcards, Lobby Cards > Checks, Paper Money, Billheads, Letterheads > Old Paper Money / Obsolete Currency / Scrip > WORLD PAPER MONEY COLLECTION - 400 All Different !!! 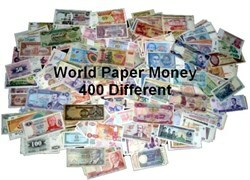 Home > Rare and Unique, Specimens > Old Paper Money / Obsolete Currency / Scrip > WORLD PAPER MONEY COLLECTION - 400 All Different !!! Hard to find - Large collection of 400 all different pieces of foreign currency. Includes Asia, Africa, Europe, Iraq and South America. Most are legal tender in their issuing countries. Small to US dollar size. Includes new countries such as Slovinia and Croatia as well as many high denomination notes from high inflation countries such as Brazil, Peru, Germany and Poland. Many of 400 Bank Notes are CRISP and UNCIRCULATED.